The Secret Theatre is a cozy ninety-nine (99) seat venue located in the heart of Long Island City, New York, down the street from Silvercup Studios and nestled under the elevated train. Of course it’s not that much of a secret to thespians, dramaturgs, playwrights, and theater lovers. It is host to The Unfringed Festival, where, as one might expect from the name, live theater ranging from the eclectic, to the sublime, can be enjoyed and savored. It is a theater festival for both new voices and old ones with long impressive resumes. 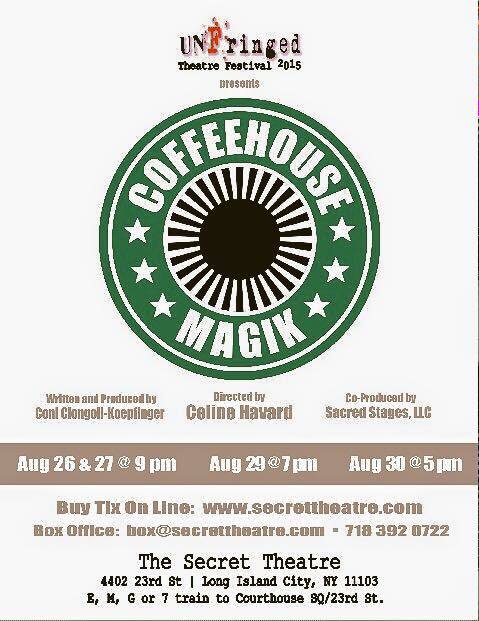 Being the culture vultures we are, my better half and I had the fortunate experience to attend the festival and catch “Coffeehouse Magik.” Speaking of impressive pedigrees, the play was written and produced by theater veteran Coni Koepfinger. Her bio states that “all of her work examines the imaginary boundaries and artificial conditionings that move humanity away from the ability to love.” If I was writing a log line for “Coffeehouse Magik,” I would be guilty of infringement, for the play falls perfectly within the parameters of her artistic statement. (Don’t worry. I’ll try not to give away too many spoilers.) The play was also co-produced by Sacred Stages, LLC. Sacred Stages is dedicated to encouraging everyone to discover the timeless universal truths of the divine. It was founded by Sandra Bargman, a professional actress, voice over talent, star of her own critically acclaimed one woman show, and a seminary trained ordained interspiritual minister. (And I thought I had a diverse bio!). Sandra also plays Val/Destiny in “Coffeehouse.” The play was directed by Celine Havard. When I walked out of the theater, I felt like the two-headed creature in the 1960’s cult film, “The Manster.” One head was my usual empty noggin; the other was filled with the themes, issues and images conjured by the play. Indeed, my mind raced through college and grad school fragments of Jungian psychology, Freud, lucid dreaming, metaphysics, quantum physics, philosophy, and physics just to name a few. Thinking about it all and trying to sort it out nearly made me miss the turn for the Henry Hudson Parkway and we almost ended up in New Jersey. I felt like Pinto (played by Tom Hulce) in “Animal House” when he is smoking pot with his professor and wonders whether they all might be existing on the fingernail of a giant. “Coffeehouse” has that kind of breadth in its vision and themes. The plot seems simple enough – but only on the surface. 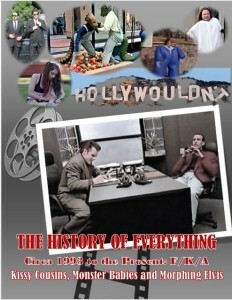 Howard Suffect (Brian Henry) is a triple threat: physicist turned philosopher turned playwright. He is a professor who seems to hate everything about teaching except the word teaching. He is in the habit of working on his play late at night in a coffeehouse served by the doting waitress, Val (Sandra Bargman). He is visited by Derrick Wyman (Lothair Eaton) – a “Dreamweaver” (one word as he explains). Howard is the HOW and Derrick is the WHY and together they go on a journey that explores reality vs. illusion, hope vs. regret, love vs. sacrifice, waking vs. dreaming and, above all, human relationships and attraction. If we are all light and energy and all made of the same thing, then why are certain people attracted to some and not others? Why do we bond to some and not others? These are the kinds of questions with which the play wrestles. The acting is superb. Brian Henry deftly shows his acting chops by exhibiting the full range of emotions as the arc of his character spins through 180 degrees of change (yes, he does spin). Sandra Bargman gives a dynamic performance as both Val and Destiny. She slips seamlessly from the needy, but endearing waitress, Val, into a wholly different character as the strong, amazon-like Destiny. She wields Fate as easily as she swings her walking stick/trident. Indeed, the Mets certainly could use her batting skills. Mantelena Papadatou is perfect as Melody Sweet, the long lost love as well as the ethereal Dreamweaver’s aide/gatekeeper/sidekick. (Not that I was ever any good with tautologies, but, at least for me, she is to the Dreamweaver as Tinkerbell is to Peter Pan). Finally, Lothair Eaton was more than capable and assertive as the Dreamweaver. This, despite the fact that he used an iPad to assist with some of his lines. Of course, in today’s world of multitasking and constant smart phone browsing even during personal conversations, maybe Dreamweavers have decided to adopt these mortal traits. What fools these mortals be indeed. The costumes were a bit over the top, but isn’t that stuff that dreams are made of? At any rate, thank you to The Secret Theatre for providing such thought provoking pieces. No matter what, “Coffeehouse Magik” will make you feel and think. Nestled in the heart of Long Island City’s artist’s quarter, set off behind partially opened parking lot gates, is The Secret Theatre. It was so much a secret, we nearly missed it, but thankfully (with a little help) we found it and were glad we did! With both an outdoor patio and indoor foyer seating and a concession stand, this quaint and inviting venue had us intrigued as to what awaited us in the theater beyond the closed steel doors. While sipping on white wine and waiting for the house to open, we had the opportunity to introduce ourselves to the delightful Coni Ciongoli Koepfinger. 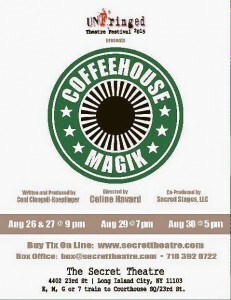 As her play, the metaphysical tale Coffeehouse Magik was a part of The Secret Theater’s “The Unfringed Festival 2015” and followed another play, it began a bit late while waiting for the earlier performance’s cast and crew to clear out. We didn’t mind the wait, as a rare night out with no kids waiting at home for us meant we had time to relax, enjoy each other, and take in our cultural interests. Coni has quite the pedigree and we’d done our reading beforehand. We expected a thought-provoking tale and that was exactly what we received, but more of that later. Coni was warm, hospitable, and genuinely pleased that we were in attendance (as playwrights who’ve met a multitude of others along the way in our own travels, not all are like this.) We were first through the door and settled quickly into our seats, front and center. The black-box 99-seat theater offered the ideal backdrop for the quirky, multi-layered feast that was to come. As many short plays are staged, including most of ours, the set was minimal – little was necessary considering the wordy and highly intellectual dialogue of Coffeehouse Magik. One’s full attention was needed to digest everything from psychology, dreams, and relationships (my background and expertise, if you will) to physics, metaphysics, and quantum physics (the latter of which Wayne has great interest) to acting and even playwriting (our shared passion, of course.) And every member of the cast melded seamlessly into their respective roles: Brian Henry as Howard “Howie” Suffect; Sandra Bargman as Val/Destiny; Lothair Eaton as Derrick Wyman; and Mantalena Popadatou as Melody Sweet. 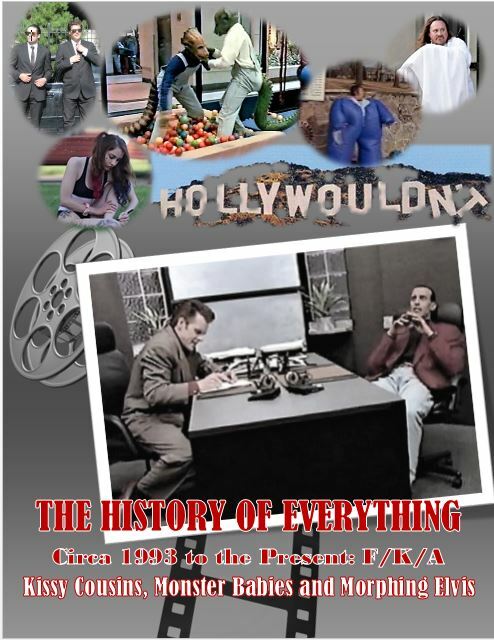 Howie was the classic “professor,” seemingly experiencing more than a bit of professional burn-out – his entire life about his work and without any kind of personal balance. With little self-awareness or understanding, he ignores what is right in front of his eyes, most especially the kindly waitress Val, who is obviously very fond of him. When he is visited by his dreamweaver Wyman, he is forced to take a look at his life, but he becomes uncertain what is reality and what is in his mind. We are introduced to a quirky sprite, Melody, who smiles and nods alongside Wyman and Howie. Who she is, unknown until a later time. The play’s tone shifts from melancholy to comedic to dramatic and at times aggressive; and in the end, like Howie, we don’t ever know what was real. What we do come to learn, is that we as human beings, often engage in self-defeating behaviors and they serve no purpose other than to prevent us from reaching our goals and becoming our truest selves. Wayne and I always have much to discuss after any performance we take in; in fact, it truly is what makes these cultural experiences live on for us. As writers, directors, and producers, it also is a part of who we are and how we grow as creative individuals. Coffeehouse Magik provided much fuel for our drive back from Long Island City to Connecticut. It was a play which delved into love and relationships; fulfilling one’s life goals and how those pursuits suit us (or how they don’t); interpretation of dreams as well as the interplay of dreams with reality; destiny; self-exploration and self-admonishment, among other themes.